Have you been sued for alleged breach of contract related to development, occupation, or sale of condos or other real estate? Are you a landlord seeking eviction assistance or a tenant in need of legal representation to get back a security deposit? Attorney William B. Hanley is available to discuss these and other potential real estate litigation issues. 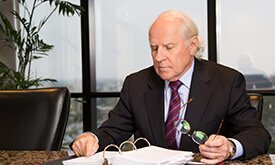 Southern California real estate sellers, purchasers, developers, landlords, leasers, mortgage brokers, and other parties in commercial or residential real estate conflicts are encouraged to contact an experienced real estate litigation attorney. It’s common for individuals with a real estate litigation case on their hands to feel frustrated or helpless. When facing any of the issues listed above, it’s important to remember that there are laws in place specifically to protect you, your financial assets, and your property. Assisting with licensing and permits. They can provide advice regarding the property, help you apply for licenses and permits, and ensure you are following set regulations. Thoroughly reviewing the property. An attorney can spot instances where property values are exaggerated or flaws are hidden. They will analyze a property and determine whether there are any structural issues that are violating state rules and regulations. Negotiating lease agreements. An attorney can anticipate issues when viewing a rental agreement and use their experience to spot small issues that could become big problems down the road. Protecting your interests. It’s the small details that can often go unnoticed in real estate transactions and lead to big court cases. An attorney will look out for your interests early on in the process to help you avoid stress in the future.